Camille has been housing yachting professionals since 1983 when she sailed down to South Florida from her home in Montreal. She started off with a couple of crew houses and over the years built up a successful business, Smart Move, which ultimately managed over 50 apartments and 15 crewhouses. In 2005 she sold her business and moved to the SW coast of Ireland where she and her husband spent the next several years renovating, decorating and managing five seafront apartments. 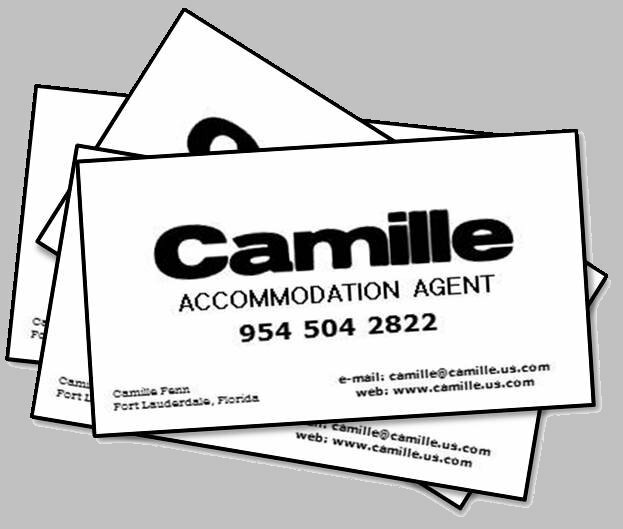 Now back in Fort Lauderdale she is doing what she does best: catering to yacht crew who expect better by providing clean, nicely decorated accommodations through her new business: Camille Accommodation. Camille has a Degree in Interior Design from the Art and Design Institute of Fort Lauderdale. In the past she owned and managed “Creative Yacht and Home Interiors” on 17th Street Causeway providing interior design and implementation for yachts and luxury homes in Fort Lauderdale. Her husband, Kerry, who did many renovations in the Smart Move days is still involved with the day to day operations of Camille Accommodation. He is also a licensed yacht captain and does freelance work for yacht brokers and agents. They have two daughters that attend the Marine Science Magnet Program at a local school and, as yet, appear to have no interest in taking over the family business! to make sure that we know what you are looking for. to ensure that you get exactly what you want. to make sure that you are satisfied with your choice. to ensure that your expectations continue to be fulfilled.